This entry was posted in brochures collectibles and tagged MINI Clubman on February 3, 2016 by James Day. 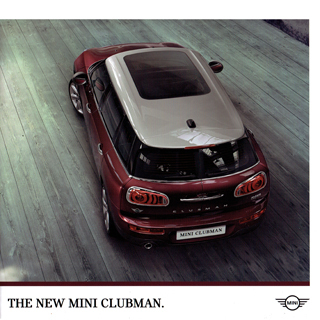 Here we have the first brochure for the new MINI Clubman. It is the first brochure to introduce the new MINI branding using the new black MINI Serif font on a white background. The 9″ stapled, 8-page brochure contains very basic information on Space, Practicality and Design, and Specifications. Colors shown: Pure Burgundy metallic, Blazing Red metallic, Chili Red, Pepper White, Melting Silver metallic, Moonwalk Grey metallic, Thunder Grey metallic, Midnight Black metallic, British Racing Green metallic, and MINI Yours Lapisluxury Blue. Roof colors shown: Melting Silver metallic, Aspen White, Jet Black, and Body color. The MINI USA catalog number is MINI-1015-153,000-F54 for use 10/15-3/16.